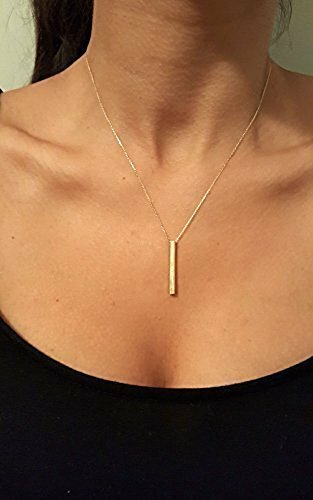 Material: 14k Solid GOLD ( not filled or plated) 14k Solid gold 4 sided cube 3D bar necklace, stylish, minimalist, delicate, This spectacular pendant can be a perfect gift for you and your love A beautiful piece perfect for giving to a special someone or as a gift to yourself. Shiny or matte options, Thickness x Length=4cm x 3mm Just fill in the "Notes To Seller" box when checking out with the name or letters, If you miss the box don't worry just send us a message with your requirements. If you want longer or smaller length, please contact me for your custom orders. You can choose your color ***14k yellow gold - 14k rose gold - 14k white gold*** This special necklace comes with special gift box. If you have any questions about this product by JeweeDiamond, contact us by completing and submitting the form below. If you are looking for a specif part number, please include it with your message.